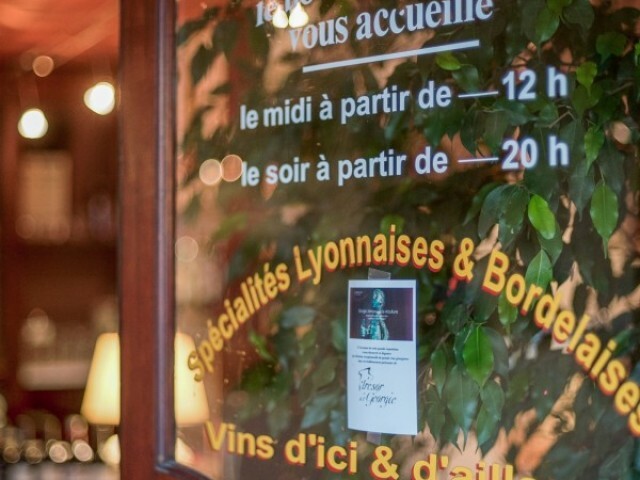 Located at the end of the quays, opposite the hangars and 2 steps from the new bridge Chaban-Delmas, this small French restaurant amazes by its atmosphere of neighborhood bistro. Installed on the terrace or in the dining room, you will immediately feel at home in the middle of the paintings, black and white portraits, bottles of wines and many other trinkets from another era. Once seated on the benches you can choose your menu on the slate that changes every month. The Chef proposes a Lyons inspired cuisine with a specialty of the famous Andouillette from "Bobosse" (famous deli of the Lyon region). At the end of the seasons, you can also enjoy appetizers such as the tarte fine with 2 hot sausages or a carpaccio of sweet pepper confit with goat mousse or a terrine of Foie Gras with cacao of which only the Chef to the secret. You can choose between a Pike Quenelle with langoustine bisque, Rognons or Calf sweetbreads, a Côté de Boeuf with a Bordelaise sauce or a good pate de Maigre to keep the line! For dessert, a good Brioche lost with caramelized apples, a style profiteroles or simply a fondant chocolate will finally satisfy you. The whole, watered by a small Beaujolais, a large Burgundy, a coast of the Rhone or a Bordeaux well-known to us. The grands crus are served in carafes.